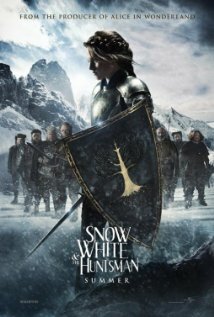 Review: Snow White and the Huntsman | The Cineaste's Lament. ← First trailer for Disney’s “Wreck-It Ralph” released. Another take on the retelling starring Charlize Theron and Kristen Stewart. Let’s set aside my deep-seeded belief that Kristen Stewart can’t act out of a box. We’ll also put aside my girl-crush on Charlize Theron and the drool-worthly-ness of Chris Hemsworth in scruff. I wanted to see this becaue of the darkness of the plot-no funny silly Julia Roberts here, but a dark fairytale worthy of the Grimm stories. UGH! OK, sure, it’s a fairytale, but come on, people! I don’t care how hot Chris Hemsworth is in his huntsman gear, he’s a commoner and no princess can marry a commoner in that day and age (medieval times). None of them. No. And what was the point of the duke? To show that Snow White is a modern gal and can choose her own destiny? Choose her own man?